Shipping charges depend on quantity and location. Shipping will be itemized during checkout prior to order completion so you can check it before purchase. Amethyst rough stonestypically range in size from roughly 1/2″ to 1.5″ inches and weights range from about 15 to 50 cts each. This African amethyst rough is a wonderful rich deep purple. It includes both rough chunks and crystal points. Most of it is great for cabbing or carving and some may even be facetable. 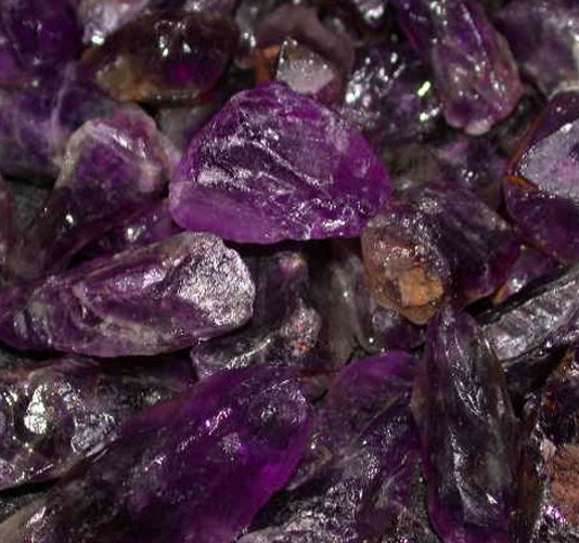 Each order is for at least 1,000 carats of amethyst scooped from our stockpile. TODAY, when you order a quantity of 2, you’ll AUTOMATICALLY be sent 3….Order 4 and you’ll AUTOMATICALLY be sent 6. But, you must order at least 2 to get this very special deal. Please Remember – Only order a quantity of 2 if you want 3. If you order 3 you will have to pay for 3, but you will get 4. Don’t delay, take advantage of this very special offer….while it lasts.